Sleeps up to 4 guests, 1 x king size en-suite and 1 x twin en-suite bedroom. Private hot tub. We stumbled across this cottage on the internet while searching for dog friendly cottages. It’s not just dog friendly! The cottage is well equipped and the hot tub is a brilliant bonus which we all loved (and made full use of). The location is perfect for getting in and around the local sites and we had a lovely time. I’m so glad we have a dog - otherwise I may have never found this gem! This was our second stay at Lady Broad cottage. Once again we thoroughly enjoyed our time there. The cottage has everything we need for a relaxing break. The area is good for beach walks, and has a good selection of eating establishments within a few miles. Our dog was on holiday with us and we found it to be a very dog-friendly area to visit. The hot tub in the garden was a very pleasant addition, and was much used during our week. The owner, Julia was very helpful and welcoming during our stay. Had a lovely two night break at lady broad cottage. Very peaceful location and the cottage was spotless. Hot tub was great and owners were helpful and accommodating. Beautiful place, perfect everything ! Thank you for your kind review. Really pleased you had an enjoyable break away. Excellent weekend spent in Lady Broad cottage, the cottage was beautifully presented inside and out. The hot tub was a wonderful extra and very easy to access from the cottage. Altogether it's a wonderful package. Would definitely book again and recommend to anyone wanting a relaxing break. Thank you for your lovely review. glad you had a nice time and hope to see you again sometime. The cottage was great as were the owners who greeted us on arrival. Sitting in the hit tube underneath the night sky surround by beautiful countryside it was the perfect getaway. Ideally situated with plenty to do near by will be returning for another visit. Thank you for your review - glad you had a nice time! Everything about this cottage was first class. Would definitely recommend to friends and family for a perfect retreat in Norfolk. Thank you very much for the lovely review. So glad you had a nice break with us and were comfortable in the cottage. Hope to see you again sometime. We wanted a few days away at a property with a hot tub. Our search was fruitless at the start as we wanted to arrive on a Thursday for 3 nights however Lady Broad cropped up and it was perfect. Wonderful accommodation with everything we needed at a very good price. I would highlight recommend this accommodation. Thank you very much for the kind review. Glad you had an enjoyable short break. Many thanks. Thank you for your kind review. We are glad you had an enjoyable stay with us and look forward to meeting you again. We just had a short 2 night stay over a weekend and we were very pleased with the cottage and location. Although the cottage was for 4 people and there was just 2 of us, it was great to have two bathrooms and alternate between a bath and a shower. The cottage was more spacious than I thought it would be and it was warm and comfortable. The hot tub was superb. We did have an issue that we contacted the owners about on our return, this was dealt with promptly and to our satisfaction . We hope to go back in the New Year . Thank you for your kind review. We are very happy that you hope to revisit us in the New Year, we look forward to it. Thank you. We wanted a relaxing weekend and that’s exactly what we got! 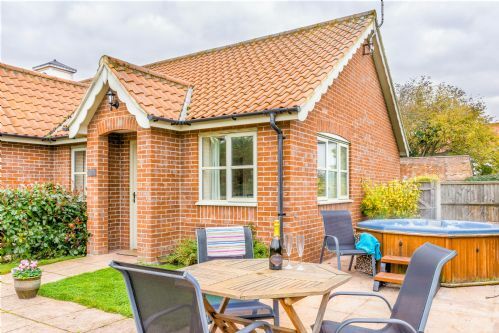 Perfect place to stay for a quiet relaxing weekend or a brilliant base to be able to see parts of Norfolk. Thank you for your kind review. Glad the weekend was all you’d hoped for, many thanks. We stayed at these accommodations on lots of occasions and always had a fantastic time on our own or with our family . Thanks for the kind review, lovely to see you all again. Look forward to the next visit. Enjoyed our second visit to Court House Cottages. Everything you need in cottage - very comfortable living space for relaxation after long days out and even more perfect with the hot tub! Great location for travelling to see more of Norfolk - beaches within easy reach by car and great for visiting places of interest. We love the quiet at the Cottages and our blind dog is very happy there too. I am sure we will visit again- we have stayed during winter and summer now and loved both stays here. Thank you for your kind review, glad all was well for you and your woofa! Hopefully may see you again sometime. Another lovely holiday at lady broad cottages, this was our third stay in lady broad cottage, but we stayed in all cottages every one is wonderful. Warm welcome, Nice quiet location and home from home for all 4 of us and our Yorkshire terrier. Thank you for your lovely review. It has been lovely seeing you and your family over the last few years and all their developments. You are always very welcome! Very friendly owners, most willing to help and readily available. Cottage really comfortable and clean. Very well equipped and all facilities easy to use. Hot tub regularly maintained and clean. Central position handy for local entertainment and activities. Thank you for your review. Glad you had a good time, it was nice meeting you. Hope we may see you again. Excellent cottage and very comfortable. The hot tub is an added bonus. The location is great and the owners are very concerned that everything is ok. This is the second time staying in this cottage. We ha e stayed in the cottages before. This time we had the pleasure of having a Hot Tub. Although the weather was exceptionally hot we still had a wonderful time, although it was too hot to venture out. The cottage had everything we. Ended to enjoy our stay. Everything was perfect, we ate out and there was some highly recommended restuarants in the info pack. We will definitely be returning. Ext year if our health allows us to. We came back home feeling rested . Thank you for your lovely review, so pleased you had a good time. It was really lovely meeting you again. Hope we do get to see you again, fingers crossed your health remains good. We had a relaxing stay in Lady Broad cottage. We have stayed previously so knew what to expect. The hot tub was great and is nice and private. The only gripes were that due to the very hot weather the quilt was just too heavy and hot, a summer duvet would have been preferred and we could have done with a fan in the master bedroom. There was a fan in the twin room but not the master. Also there was a lot of lime scale in the kettle which was there every time you made a hot drink. No amount of rinsing out got rid of it. Apart from that everything was great. The welcome tray was a nice touch and milk in the fridge. Would certainly recommend the cottages. Thank you for your review, glad you had an enjoyable stay. I’m sorry to hear about the limescale in the kettle- we are in a very hard water area but I can assure you the kettles are regularly descaled, every 3-4weeks. Please do mention things like this when you are visiting because they are easily put right. Point taken about the duvets- we have been taken by surprise this summer with the heat, but will bear this in mind for the future! Hope you received your cables sent back to you! Look forward to welcoming you again sometime. We had a lovely week in Norfolk and Lady Broad cottage was the perfect place to stay. We were very well looked after by our hosts in a very comfortable cottage set in an ideal location. The whole process from booking to arrival at the cottage was seamless and the booking and other queries were answered quickly and effectively. The owners were very pleasant, checking we were happy with everything and encouraging us just to ask if we had any problems. Lady Broad Cottage was beautifully laid out and the furniture and soft furnishings were good and pleasing to the eye, it had a very homely feeling and this carried on in the bedrooms, the main bedroom had an ensuite shower and the second bedroom (a twin) a bath, both bedrooms were well furnished and co-ordinated but more importantly the beds were comfortable. The kitchen had everything we needed to prepare and cook meals and the was plenty of cupboard space, there was also a dishwasher and a washing machine. Worthy of note is the fact that there were copious amounts of hot water and the water pressure was excellent - a million times better than mine at home!! The outside areas were secluded and a lovely honeysuckle surrounded the garden, making our seating area and hot tub very private. The outlook from the front of the cottage was a large area of grass and tall trees, which gave the impression of being in the middle of nowhere (we weren’t), it was very peaceful and restful. I have to say on booking the cottage I wasn’t looking for a hot tub and to be fair I didn’t think we would use it, we did and it was a lovely experience - clearly we are never too old to experience new things. Overall we were delighted with cottage and would definitely recommend it to others. This was our 3rd visit to Court House Cottages & 1st to Lady Broad. It was as comfortable & welcoming as ever. The garden is now enclosed so was great for our dog & we loved the hot tub which we used everyday. It is well situated for either visiting the coast or The Broads so there is loads to do in easy distance. Thank you for the lovely review. It was nice to see you again and glad the cottage was as good as ever. Look forward to seeing you again another time. This was our second visit to Court House Cottages. Beautiful and Quiet location with amenities a short drive away. We had a very relaxing stay with our small dog. Plenty of outdoor space to relax and enjoy the summer weather. Owners Julia and Robert lovely and welcoming. Cottages very clean and tidy, lovely welcome touch of biscuits, fresh milk and fresh flowers. Has everything you need from cleaning products to cookery equipment and hot tub an added bonus to relax in. Would definitely visit again and recommend to others. We had an amazing weekend getaway, so relaxed and romantic. The cottage was immaculate, was secluded away. The area was lovely and peaceful. Everything was there that we needed, plus more! Been recommending this cottage to everyone! 100% will return! Loved every minute of it! The cottage was lovely, with everything we needed for a short break. The bed was wonderfully comfortable and the hot tub was particularly relaxing. The grounds were secure and the locality was ideal for our Labrador. Although we were a few miles from the coast, it was only a short journey to find beautiful, quiet beaches. We particularly enjoyed seeing the seals at Horsey. Julia was very welcoming when we arrived, and kindly provided tea, coffee, biscuits and flowers for us. We have already recommended Lady Broad Cottage to our friends and would love to visit again. It was really lovely to turn up to Lady Broad Cottage and just be able to settle in before having to meet anyone. It was good too that we were visited by the owners on the beginning of our first full day; we felt welcomed. The cottage was warm throughout our stay, the kitchen is well stocked with utensils etc and the living conditions were very comfortable. We had a great weekend break here. The cottage was lovely and clean and had everything we needed. The location was peaceful and the hot tub was a fantastic bonus. We will definitely be recommending Lady Broad Cottage to friends. Thank you! Fantastic little break. Nice warm cozy cottage with added bonus of hot tub. Good location. 15 mins drive from Yarmouth. We will defo visit again.